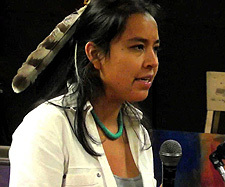 Nationally renowned singer/songwriter and Indigenous Rights activist Lyla June Johnston, of Taos, New Mexico, will headline Brattleboro's new Fantastic Wantastiquet Festival in a gala keynote gathering at the Latchis Theatre (50 Main St., Brattleboro) at 2:00 p.m. on Saturday, September 16. "Lyla June's presence here heralds a call to people of all nations, particularly First Nation / Indigenous peoples, to converge on the Wantastiquet region," said John Wilmerding, Festival organizer. Wilmerding first conceived of such a festival in the Spring of 2015 as a plan to bring the area's arts and cultural offerings in foliage season under one marketing banner. "I knew it would elevate and transform us and enhance our relationship with these lands," he said. The name of the Festival in effect recovers and re-claims the original name of the West River—'Wantastiquet,' which, according to various translations, means 'river leading west,' 'river of the lonely way,' or 'lost river.' 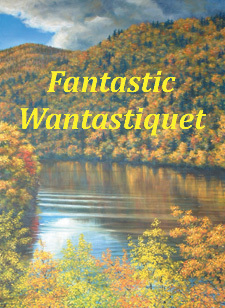 Believing that this name could be unifying for local people and places, Wilmerding decided to call this new festival "Fantastic Wantastiquet." Forced by family issues to postpone organization of this regional festival for two years, Wilmerding learned that in the interim a successful effort was under way to have the Town of Brattleboro observe this year's Columbus Day holiday as Indigenous Peoples' Day. "This has deepened the Festival's emphasis on these peoples and lands," he said. "It has enabled us to choose new themes and content for the Festival. However, we are not organizing local Indigenous Peoples' Day events. Those are being created by indigenous folks who live here." The official themes announced for this first year of Fantastic Wantastiquet are Celebrating People and Place—the local rivers (especially the Wantastiquet/West River and the Connecticut), our prime Fall Foliage, and the other natural beauty found in our area—and The Better Angels of Our Nature, referencing a quote from Abraham Lincoln's first inaugural address and giving impetus to exhibits, events, and other such projects that help us engage with peace-making in particular, social consciousness of all kinds, and personal aspiration and self-development. "Lyla June, however, carries her own themes with her, especially the central theme of her most popular song, 'All Nations Rise,'"said Wilmerding. A widely renowned performing artist, Johnston was responsible for helping indigenous and other peoples to rally last year near Standing Rock, N.D., to protest the Dakota Access Pipeline, and also at a subsequent Unity Rally near the Black Hills of South Dakota. Other special guests at this gathering will be traveling from afar, as excitement in Brattleboro grows for our first Indigenous Peoples' Day activities in early October. The Latchis program at 2:00 on September 16 will be admission-by-donation, with a suggested amount of $10 per person but a no-one-turned-away policy. Proceeds will go to charities benefitting indigenous peoples, especially youth suicide prevention and women's issues. All Souls Church, aka West Village Meeting House, is at 29 South St., across from the newly constructed West Brattleboro fire station and the village green, a little over a mile west of Exit 2 off Interstate 91. Call the office for further info, (802) 254-9377. The full guide of local events during the Festival season will be published through The Commons newspaper, a major local sponsor of the Festival. Advertiser support will appear in a special supplement section of the paper's September 6 issue. For more information, please contact John Wilmerding at (802) 254-2826 or email FWF@myfairpoint.net.